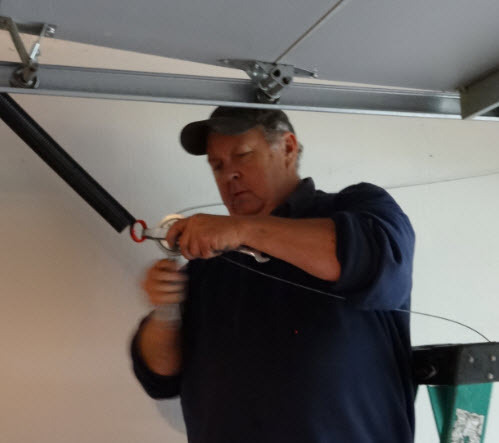 Keeping the garage door maintained, in straight working order and lubed for ease of operation can help extend the dependability and useful life of the system. Costs to make most repairs vary from a minimal service call, to in excess of several hundred dollars for addressing multiple issues at the same time. These prices based on the type of repairs, who is performing the service and the commonality of any parts being supplied. Replace Springs - a frequent request, it is important that correctly rated extension springs, such 120 lb and 150 lb rated springs accompany the existing door. Replacements are typically priced either as a single unit or at a reduced combined amount for a set - and this ranges from $185 to $275 for a single spring and $235 to $425 for both springs. Rarely however, quotes for springs can go as low as $130. More for torsion springs (on the wall over the door) than for extension springs (near the tracks). When a spring has broken, cables likely will have to be re-wound through pulleys & then properly set. Replace Cables - although cables rarely fail, replacing the set can run at extreme varied amounts, between $16 and $99. As such, getting cables as an option as part of a total upfront estimate can help prevent surprises. Adjust Door - most fixes account for a straight and proper adjustment of the door, with perhaps a $10 hardware charge attached. Including tightening of the hinge bolts like pictured here. 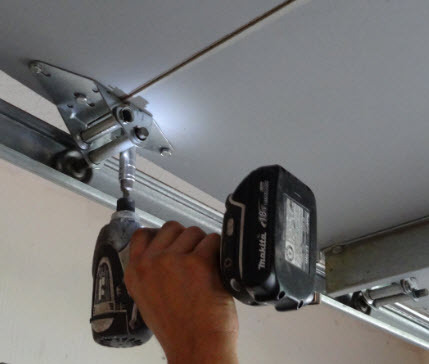 Many garage door companies may lube the rollers and moving parts or else include it with the service call fee while other outfits can omit this during the adjusting process. Changing Damaged Panels - performing repairs on the panels, such as those damaged, will depend on if the door is made of aluminum, wood, composition or fiberglass. The main challenge for unfinished doors will be at arriving at an acceptable match with the surrounding others - and this holds particularly for natural stained doors. Prices to replace the panels begin anywhere from $130 for a fiberglass panel, plus hinges, all the way to more than $225 for a wood panel section, based on wood type, grade and dimensions (assumes repairs are isolated to panels themselves). Replace Sensors - with their positioning near the door bottom, sensors often take impacts from nearby movements and/or suffer from constant wire disconnects. Brand will definitely matter, but costs to replace go from $55 with mounting bracket on up, depending on the physical unit itself. Wall Pads/Control Panel - installing a new electronic keypad should cost anywhere from $60 for basic models, to $135. Select brands run more. Wired models slightly greater than wireless for the sending wire. Chains/Belt - chains might need adjusting at the tensioner, which is also done when changing out the drive gear ($55 to $70). If a belt needs chaning it will depend mostly on the size, be it a common 7 foot or 8 foot or larger and which prices go from about $80 to $140 that may or may not include work on the idler assembly. Gear drive units aside. Replace Rollers/Hinges - replacing rollers, that may be making noises, should bring a $6 charge on the low side to $15 - based on the number being replaced, the difficulty of access, and if new left or right side tracks are going in at the same time - with the tracks themselves under a hundred dollars. Replace Circuit Boards - the circuit board is another brand specific pricing item. Garage door service companies that do replace circuit boards charge $90 to $160 and this typically will figure by specific brand. Along with the board swap, the repair will commonly require some reprogramming of device(s). For those doing yourself, many of the control boards can be found online with prices for replacement to fit Genie models among the least expensive available between $40 to $70. Many Liftmaster and Sears Craftsman boards fall in the low $60 dollar range and Stanley has been know to push its prices up to the $80's and topping the $90's. Available at retail volume dealers. Bottom Weather Seal - given enough time and wear, the lower seal tends to wear out. Seals that match existing doors may be sold on a per-foot basis at under two to three dollars per foot (with top door seals similar or less). Retrofit solutions may come equipped with a dedicated track that adapts to the door -- the molded rubber seal simply slides in from a side and then is trimmed to fit. Kits are based on door thickness, door width, and styles, ranging from $25 to $70 for most applications. Certain door service companies fail to quote lower seal work particualrly on less common models, deeming them too problematic a fix. Make sure any springs are rated for your given door size and weight. Springs are also rated on expected amount of use, for example, 7,000 or 10,000 cycles. Smaller, more local shops often perform the same identical fixes for less amounts. Since the whole door acts as an interconnected system, where one component affects another, for example, non-straight tracks or bad rollers bear some amount stress on other parts of the system, it's normally prudent to make sure all components are inspected regularly to help ensure the best chances at future workings.